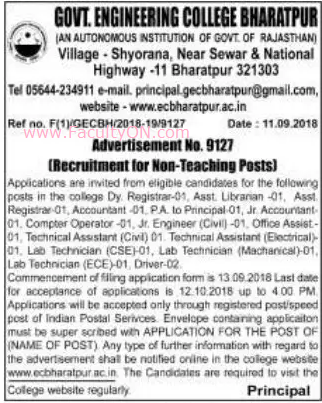 Government Engineering College, Bharatpur has advertised in the PATRIKA newspaper for recruitment of Non-Teaching Faculty jobs vacancies. Interested and eligible job aspirants are requested to apply on or before 12th October 2018. Check out further more details below. About College: At the serene outskirts of the city Bharatpur, GECBH is located at Agra-Jaipur National Highway No.-11. It was established in the year 2007 with a vision "To make students technologically superior and ethically strong and build them as professionals who will become the trendsetters in the industry". Since then it has constantly grown with very fast pace. It is the first government engineering college in the Bharatpur division. The campus is spread over an area of 40 acres. It offers students a peaceful atmosphere.